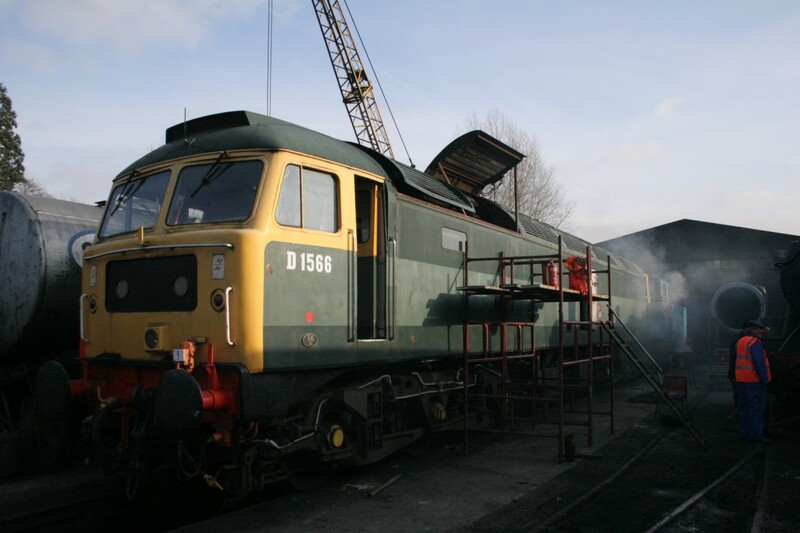 Ever wanted to know what goes in to the repair and overhaul of a Class 47 in preservation? Read on….this page will be updated with news of the work underway to get D1566 back into traffic for the 1960’s weekend in July (hopefully!). Work will include repairs to the cooling system, bodywork and repainting. 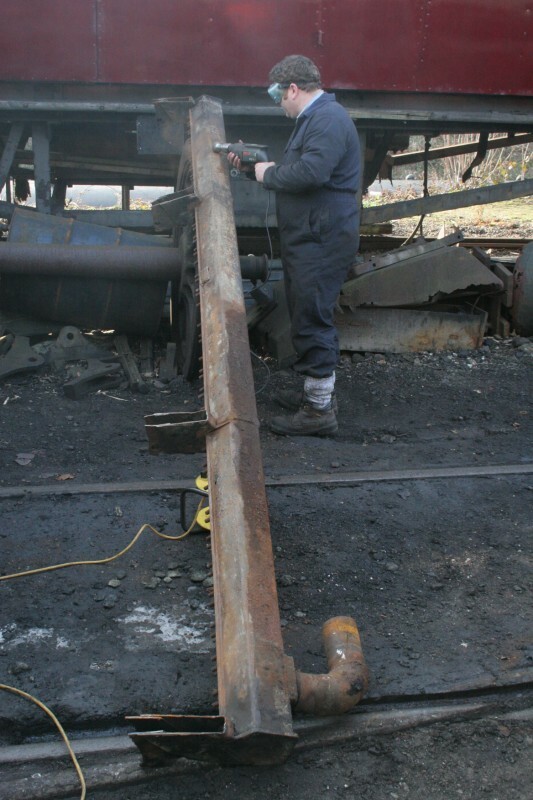 Work resumed on the cooling system with the corroded bottom radiator manifold lifted out of the loco after removal of the radiator elements last year. The photos below show work in progress. Dai Thrash at work on the removed bottom radiator manifold after removal. This component was not designed for easy removal by Brush, so assistance of the gas-powered variety has been sought. The problem. Rusted through in several places. It’s likely this section of the pipe will have to be replaced with a new piece of steel channel utlising the original fittings. 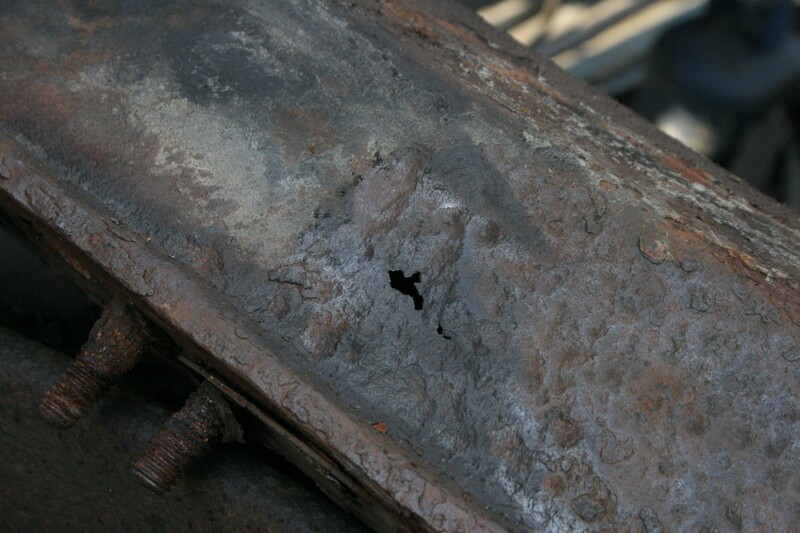 Over to Mr Owen’s A-Team in LR Engineering we suspect…..
Welding repairs to the radiator manifold are now thought possible instead of replacement. All radiator elements were tested for leaks with only one proving faulty – much better than was expected. Whilst empty, the radiator bay will also be cleaned and painted. The radiator manifold has been repaired and patched. All cork gaskets on the elements have been replaced with new parts thanks to RTS. The system is now being reassembled as and when time allows. With 6940 now (hopefully) fit again and D5310’s wonderlust fulfilled, we hope progress will speed up. 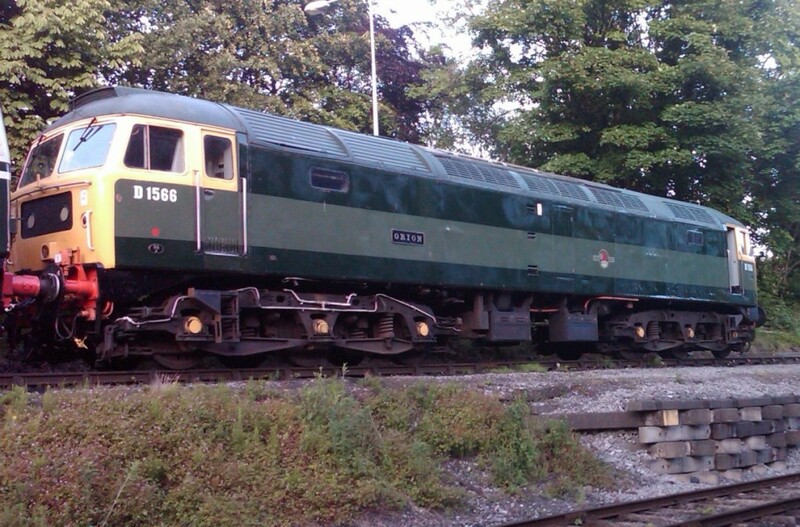 The aim is to have D1566 available for traffic in time for the 1960’s weekend on 30th and 31st July, although the bodywork overhaul will not be started until after then. 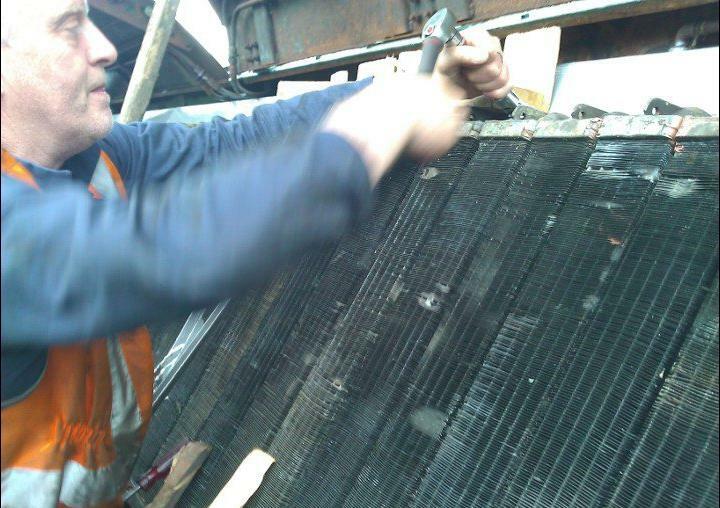 Repairs are progressing well, with the radiators due to be reassembled very soon. Corroded electrical conduit in the engine room has also been replaced with modern plastic trunking. The wiring within the conduit was found to be in excellent condition, with only one low voltage control wire requiring replacement. Comprehensive Series-Parallel 47 electrical schematics have been kindly provided by another Preservation Group, which will be invaluable in helping trace any faults. The locomotive will re-enter traffic without bodywork repairs or a repaint this year, however a clean and polish was undertaken today which has made the locomotive look a lot more presentable, as Colin Cooper’s photo below shows. 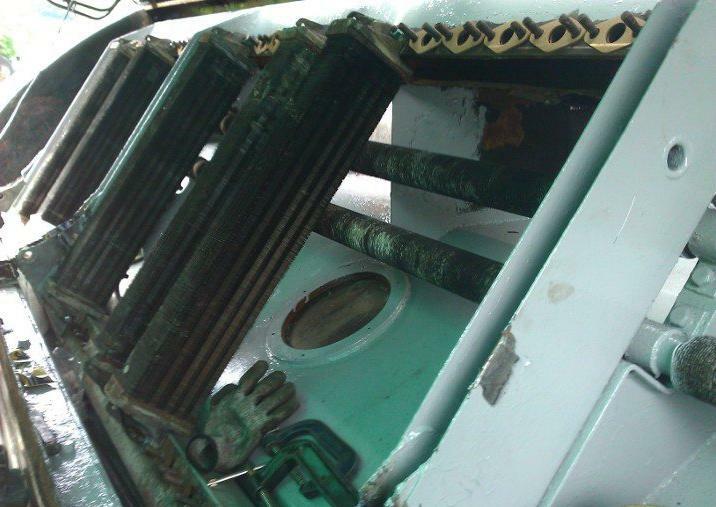 Radiator elements undergoing reinstallation into the repainted bay, photos by David Dawson. A few false starts and ‘Das Boot-like’ scenes traced the few remaining leaks, including the pipe popping on the line to the water pressure gauge. The coolant system is now watertight and the power unit ran well. We’re still way off being able to move the loco under her own power as some electrical issues have come to light. Nothing appears to be too serious, most resulting from a lengthy period out of use through two nasty winters. A few contactors and relays will need removal for a bit of TLC, but the Group are delighted with todays start up and remain confident that there will be 12LDA action in the Dee Valley for our 60’s weekend on 30th and 31st July. Work continues to progress well, the loco has been running again over the last week with auxillary machines now operational. A faulty relay has been removed and refurbished, once refitted later this week we hope to be able to take power and move the loco under her own power for the first time in nearly two years. Fingers and other extremities will all be crossed! A further step forward today. D1566 has taken power from No 2 end. 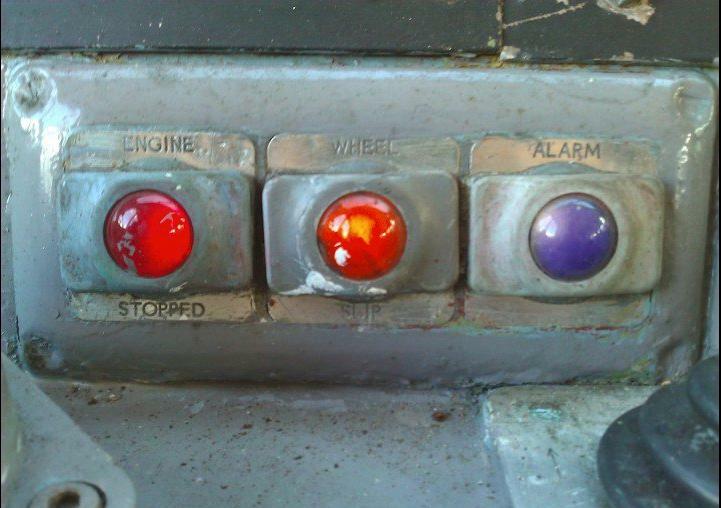 We have a brake fault to resolve and a few things evidently need belting with a hammer to get power from No 1 end (usual procedure then) – but things are now looking very positive for the end of the month. Further work will take place in the week and, if all is well by next Saturday, the loco may have a test run by top and tailing with 6940 on the last trip of our running day next Saturday. Loco now taking power both ends and was acting as super shunter at Llan last night moving stock about. A brake fault still needs attending to, but we’re looking good! The brake fault was repaired and the loco was passed as ready for a loaded test run. 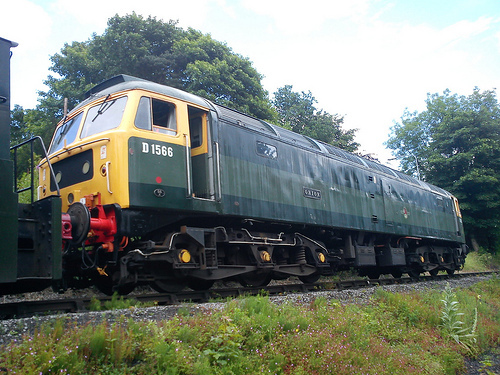 The 47 was added to the last train of the day, the 16:00 from Llangollen in top and tail with 6940. All went well, and the LDG was able to welcome D1566 back as an operational member of the fleet. 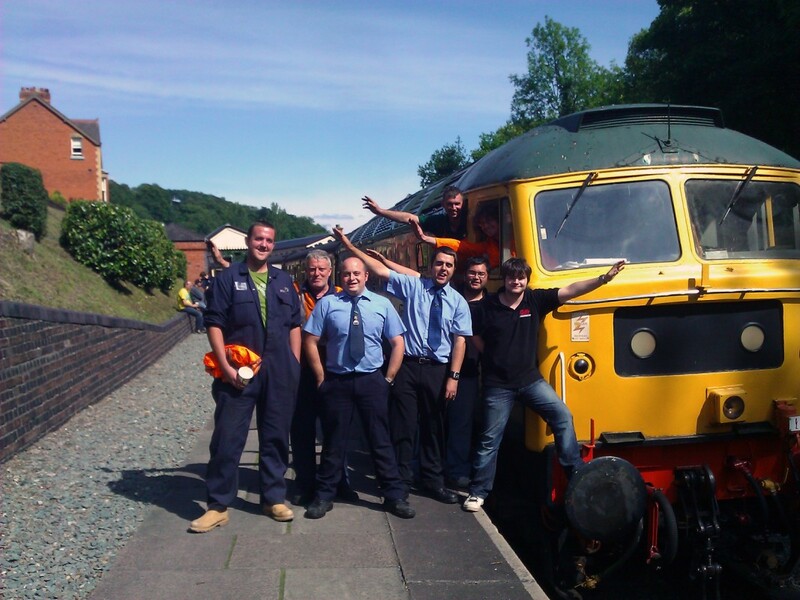 David Dawson’s excellent photo below shows the Brush Type 4 ready to leave Llangollen with a highly appropriate seminar of the team who have put many hours of hard work into getting the loco back into traffic. And then another from David, showing the loco hitching a lift back to Llangollen with 6940 on the other end, leaving Glyndyfrdwy. And finally, here’s a video from Tom Shilliam showing the resurrected Type 4 pacing the service train hauled by Class 37 6940 on 23rd July at Goods Junction. The speed limit on the branch to Pentrefelin does not allow the 47 to try and keep up with the 37 as it accelerates away! 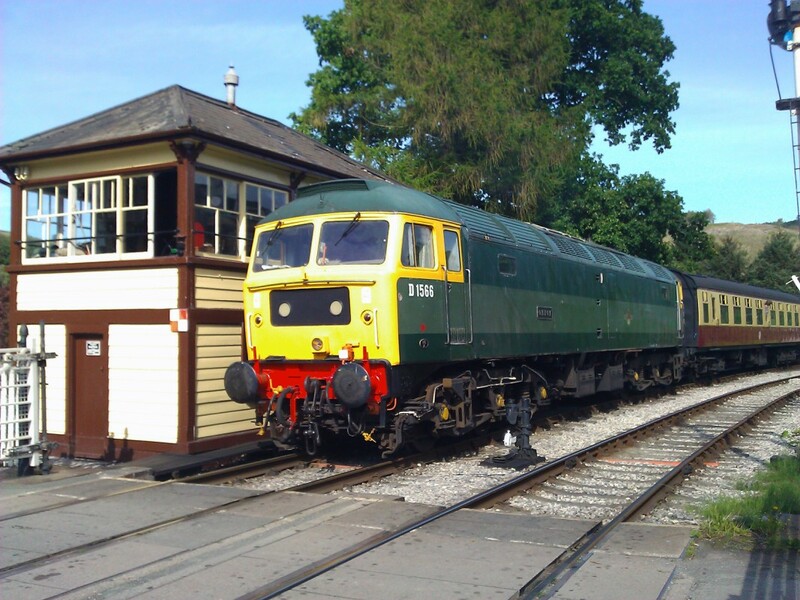 Although this excellent progress should now see D1566 take part in the 1960’s weekend on 30th and 31st July, there are still plenty of things to take care of on the loco. The batteries are likely to require replacement in the near future and the bodywork needs attention, which is planned for over the winter. This diary is therefore by no means complete!